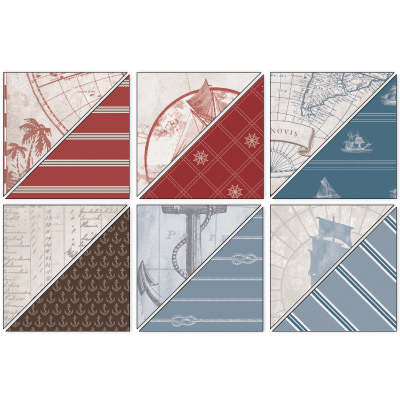 Trinity Designs: Headed for the 'Open Sea'! Not to rub it in or anything, but did I tell you that we are headed for the beach this afternoon? Yep, as soon as Emma is done with her skating exhibition, we are 'southbound and down"!! We are finally getting a trip together as a family this summer and we are just a little excited about it. This summer has been a crazy ride for us and we've been going in a bazillion different directions. So the next 6 days are going to be wonderful to slow down and unplug. One of my favorite places to do that is the beach. Any beach. I have some favorites, but there's just something wonderful about heading down to the water. I love feeling the sand between my toes, smelling the salt air, and feeling the special ocean breeze that's like no other that just pushes all my stress away. So yes, get me to the beach and I'll come home a changed woman! I definitely had the ocean in mind when I created this card. 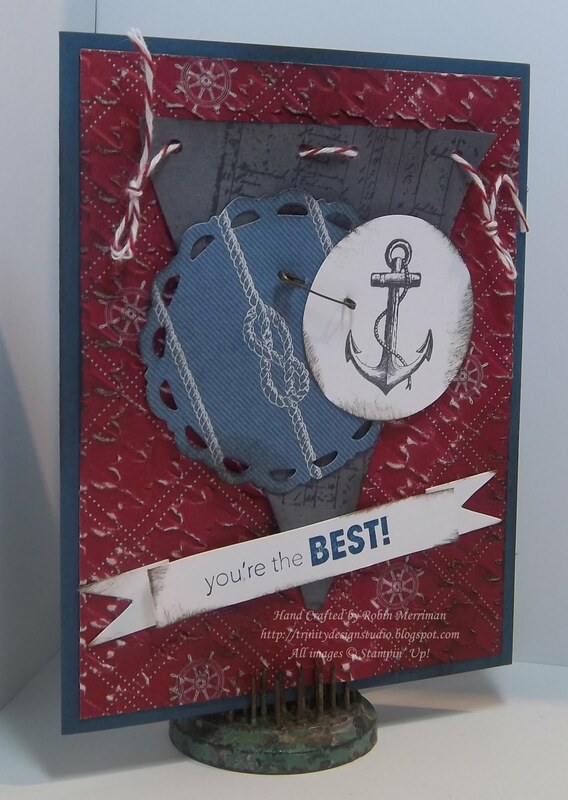 It's one that we did in my Just Cards classes this month and it has a little bit of everything on it! The card base is Not Quite Navy and I've layered it with a piece of the Nautical Expedition Designer Series Paper. 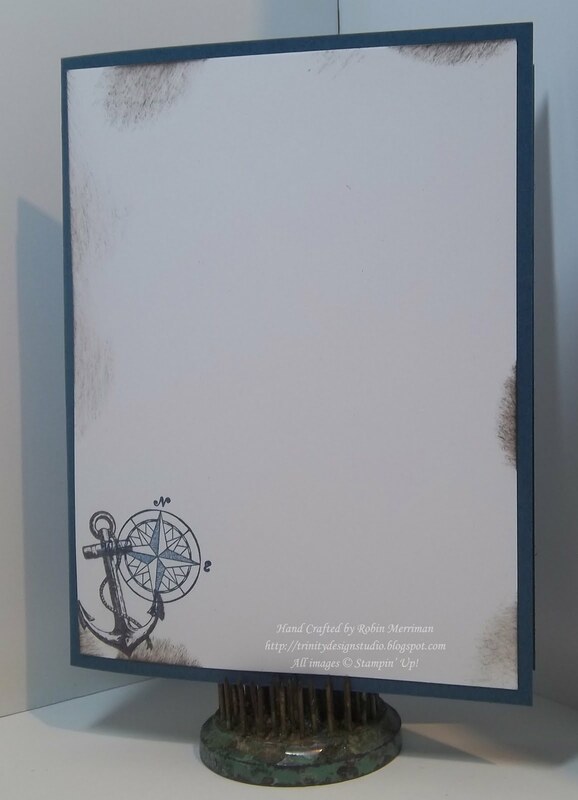 I ran it through my Big Shot with the new Houndstooth embossing folder then used my Sanding Block to rough it up and reveal a little of the white core of that paper. Next, I used my Stamping Sponge and rubbed a little bit of Early Espresso Classic Ink on it. And that's just the Designer Paper Layer! So, let's move on to the pennant. Once I stamped the image, I sponged it a bit with some Early Espresso ink and then used my Bone Folder to curl it so it looks like it's waving in the breeze. A couple of sailorish knots completed that element. For the next embellishments, I took another piece of the Nautical Expedition DSP and cut it out with one of the circles on the Perfect Pennants Die. More Early Espresso ink on that and next came the circle element. 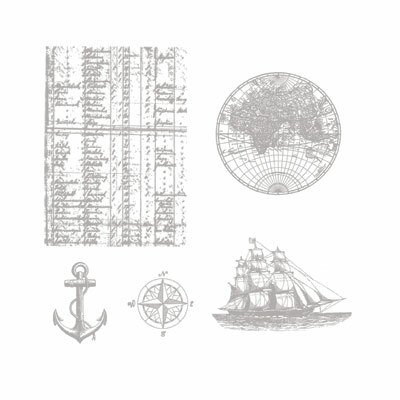 I stamped the anchor image on a piece of Whisper White cardstock and punched it out with the 1 3/4" Circle Punch. A little more sponging and I secured them together with a small safety pin from the Vintage Trinkets. 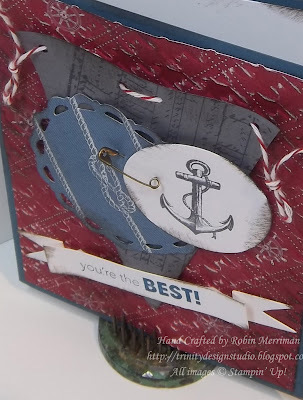 All of those layers were added to the card front with Stampin' Dimensionals. 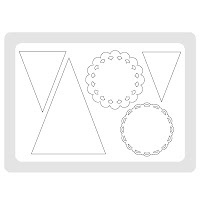 The banner was cut out with the Petal Cone Die and then stamped with a greeting from the Perfect Words Hostess stamp set. I used Not Quite Navy ink for that stamping. A little more Early Espresso for the sponging and I added it to the card front with more dimensionals. But it's pretty simple. Just a bit of stamping in the lower corner, yes, some more sponging and it's ready to go! Just like me! Ready to GO!! LOL! Don't Forget - Buy 3, Get 1 Free on ALL Designer Paper priced at $10.95! 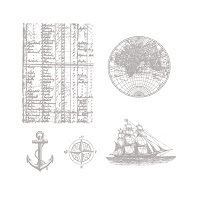 All of these items and more can be purchased through my Online Stampin' Store at your convenience, 24/7! Thanks for stopping by today! Be sure to check back tomorrow - I have a fun class announcement to share, even though I'll be laying on the beach!! And lots of card ideas to share next week - my blog isn't on vacation, only me! I love the card, and boy I can't tell you how much laying on the beach even if I would be wearing a cover up over this old bod, I do love the smell and sounds of the sea too. Have a much needed vacation and have an ice cream cone.